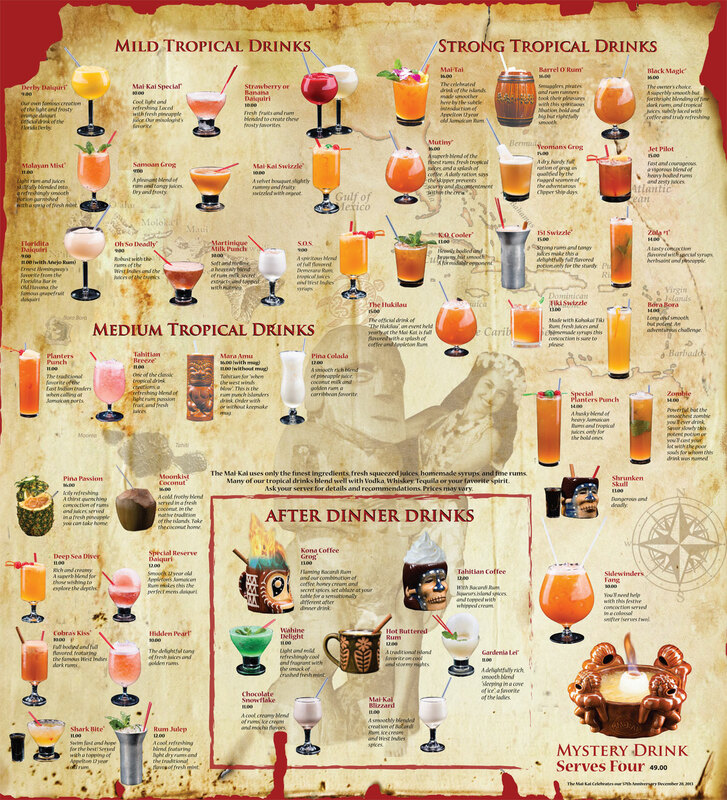 The 16 deadly drinks in the “strong” section are no doubt the stars of The Mai-Kai’s legendary cocktail menu. There’s a reason they comprise 13 of the Top 20 in our rankings. 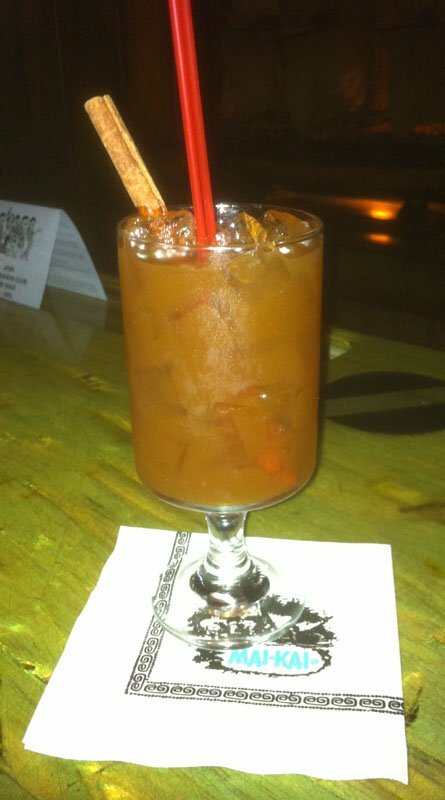 They’re by far the most inventive, mysterious and flavor-packed drinks on the menu. Just be careful when imbibing. The Mai-Kai doesn’t use the word “strong” lightly. Most contain at least 3 ounces of rum, some the higher-proof variety. Among these, there are “strong” drinks and then there are “STRONG!” drinks. In the latter category, one of the first cocktails that comes to mind is the classic 151 Swizzle. Like many Mai-Kai drinks, this deliciously dangerous concoction dates back to Tiki originator Don the Beachcomber and has been on the Fort Lauderdale restaurant’s cocktail menu since its opening in 1956. 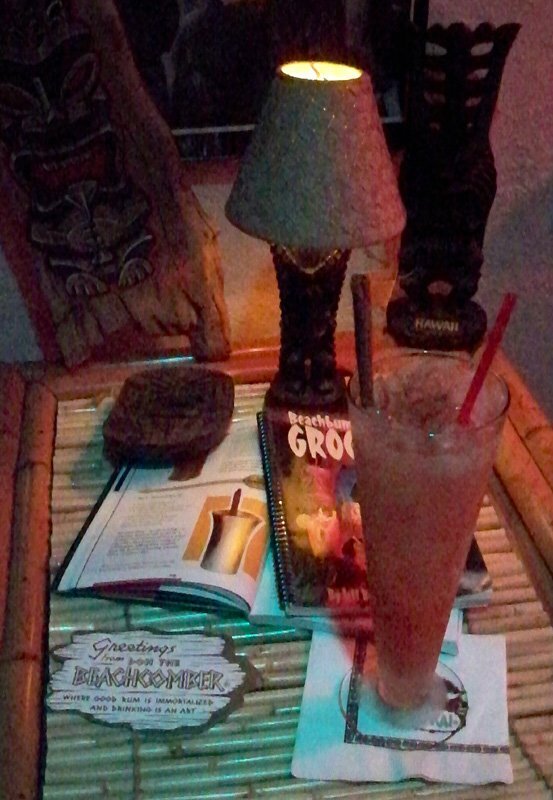 It has become an iconic standard at the world’s top Tiki bars, such as the Tiki-Ti in Los Angeles. At Hale Pele in Portland, The Mai-Kai gets a shout-out in the menu description, and the presentation is very familiar. Revealed in Jeff “Beachbum” Berry’s groundbreaking 1998 cocktail guide, Grog Log, the original Don the Beachcomber recipe is no secret (see below). As cocktail sleuth Berry pointed out in the book, it was originally served in a metal cup with a flared top, “but good luck finding one.” The Mai-Kai, of course, follows tradition and has always served its 151 Swizzle in a frozen metal cup. 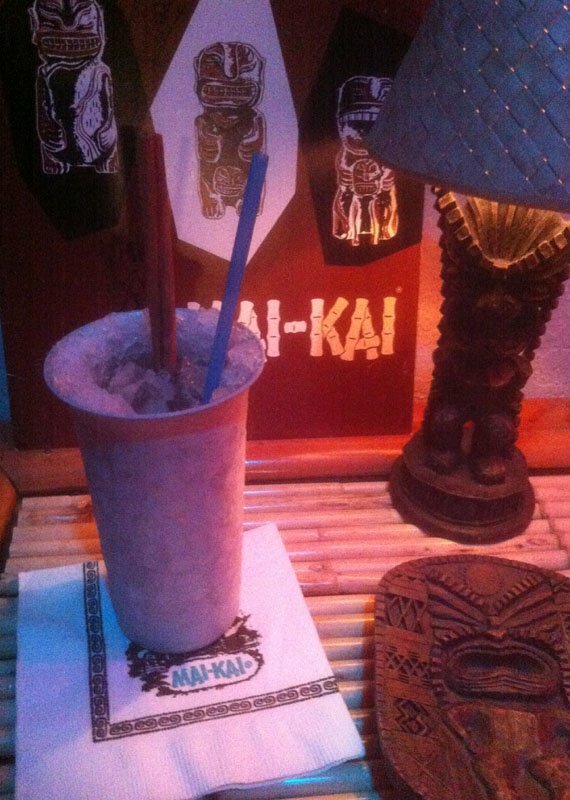 Beyond the cup, The Mai-Kai’s version of the 151 Swizzle is unlike any other. 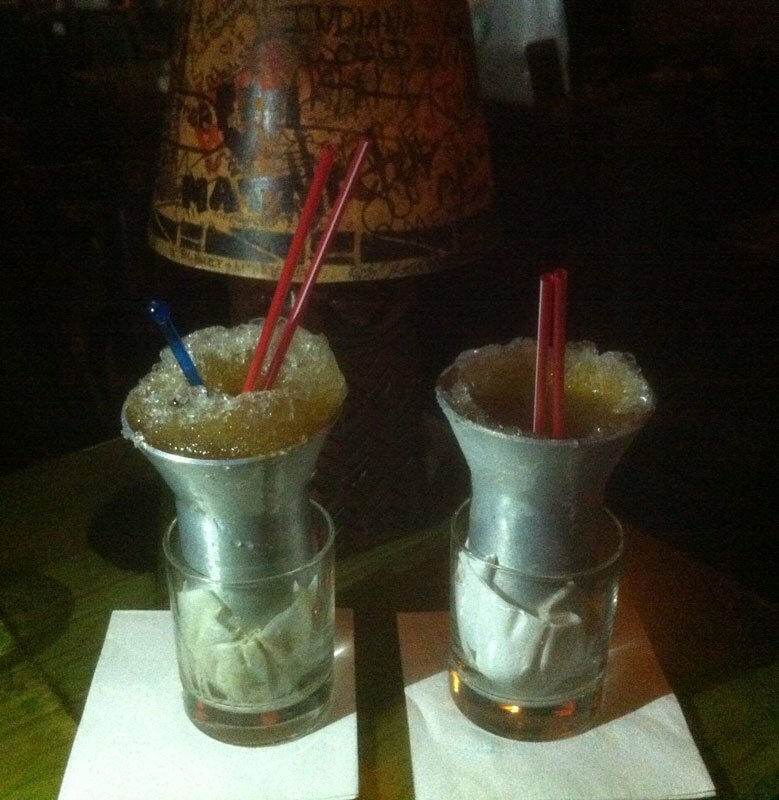 Like many Mai-Kai drinks, it’s based on the Don the Beachcomber version but was given a unique twist by original owner Bob Thornton and mixologist Mariano Licudine, who learned his craft from Donn Beach. I’ve taken a stab at re-creating the same flavor profile and have posted an evolving “tribute recipe” below. Like Thornton, current owner Dave Levy (Bob’s stepson) likes to tinker with the recipe from time to time, especially when changes are made to the rums. The recipe grew out of discussion on The Grogalizer, a site highly recommend if you’re a fan of classic Tiki cocktails. Developed by The Swank Pad’s Tim “Swanky” Glazner, The Grogalizer is a database of hundreds of recipes from all of Beachbum Berry’s books, plus a few select others. The site allows you to rate the drinks, see how other mixologists rank them and share comments on each. Sign up (it’s easy) and keep track of your progress through all the great recipes in these books. It’s also an easy way to keep track of all the various bar ingredients you’ll need to re-create these classics, which include many in this guide. After compiling your online bar, you can figure out which drinks you can make with which ingredients as well as resources for buying hard-to-find stuff. 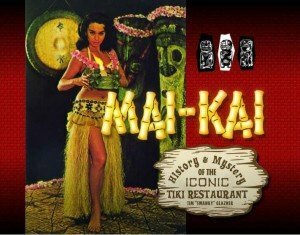 In September 2016, Glazner released his long-awaited book, Mai-Kai: History and Mystery of the Iconic Tiki Restaurant, an essential addition to any Mai-Kai fan’s collection. The evolution of the tribute recipe has gone through several stages, as you’ll see below. The first big breakthrough came in March 2012, when I discovered Kohala Bay, a rare dark Jamaican rum that was a key ingredient in many of The Mai-Kai’s strong cocktails. In addition, a search of eBay yielded a set of metal cups that were similar to the real deal. With the cup and rum in my arsenal, I was able to come up with a much more accurate tribute recipe. But just when I thought I had it down pat, The Mai-Kai dropped a bombshell in late April 2012 with the reintroduction of Lemon Hart 151 Demerara rum, which had been absent from its bars for some 15 years. This only made a great drink even better and returned it to its vintage recipe. This resulted in tribute recipes 2 and 3. 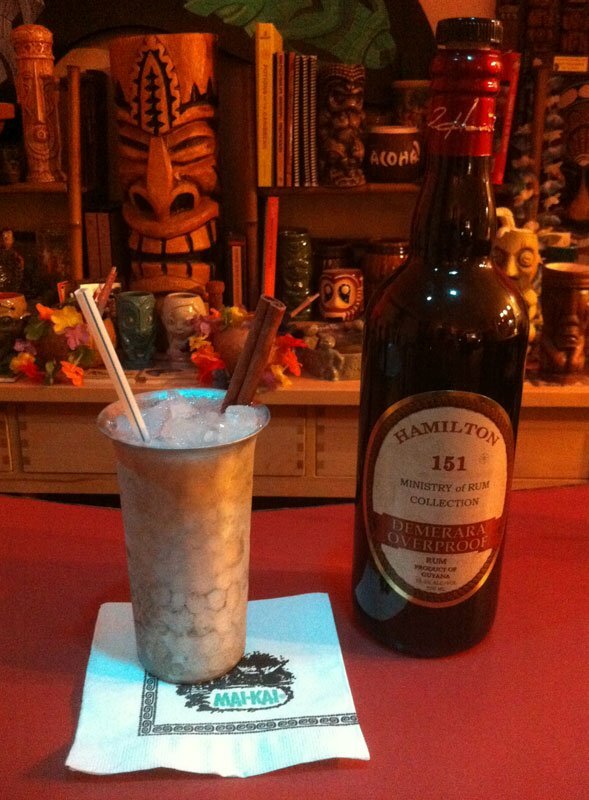 The fourth variation of the recipe, created in early 2015 when Lemon Hart was replaced by Hamilton 151 rum, is more complex and full of outstanding flavors. But when it comes to obscure rums, change seems to be inevitable. Wray & Newphew ceased production of Kohala Bay in April 2016, leading to The Mai-Kai to scramble to find a suitable replacement. Several different rums were tried and rejected before Appleton Estate Reserve Blend became the permanent stand-in for Kohala Bay during the summer. Then, Lemon Hart 151 returned to the market with a revamped blend, bottled with the classic yellow label. The Mai-Kai quickly brought the venerable rum back to its bars and into the 151 Swizzle. That led to the latest two revisions of the 151 Swizzle tribute (versions 5 and 6), which account for the new rums and also our mistaken assumption that cinnamon syrup was featured in the recipe. 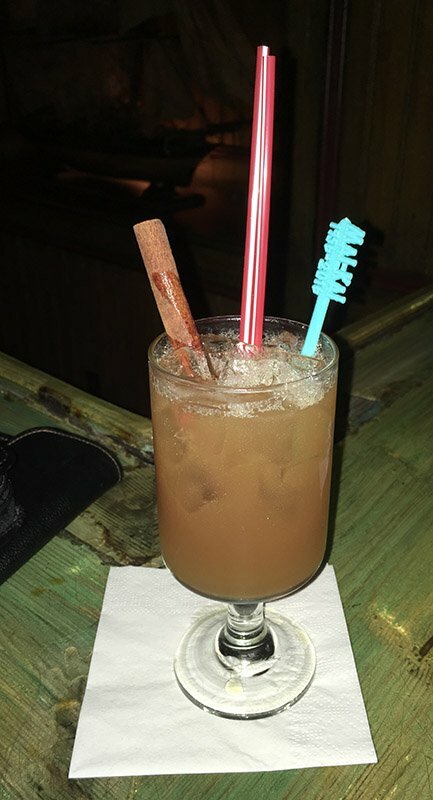 The cinnamon stick garnish sure gives you that illusion. So now we have an embarrassment of riches: Six different tribute recipes for your mixing pleasure. Just remember, as always, to consume with caution! Strong rums and tangy juices make this a delightfully full flavored potion, only for the sturdy. Flavor profile: Strong and flavorful rums, sweet syrups including falernum, a touch of anise. 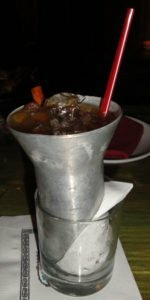 Review: Served in the traditional metal cup, this very strong drink packs a punch yet is loaded with intense sweet and exotic flavors. Ancestry: The Mai-Kai’s version of the Don the Beachcomber classic has been on the menu since the restaurant opened in 1956. Bilge: The distinctive metal cup is designed to keep the drink ice cold. The cup is so frigid, in fact, it’s typically served inside a small glass to make it easier to handle. Until recently, eBay was the easiest source for aluminum tumblers that are similar, but not exactly like the original cups. 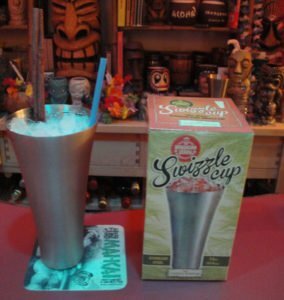 As noted above, Beachbum Berry and Cocktail Kingdom came to the rescue in May 2015 with a sleek, vintage Swizzle Cup with a flared top. Berry’s design is very close in size and style to the current cup used at The Mai-Kai. The only difference between these and the originals is the stainless steel is lighter than the heavier metal used in the 1940s and ’50s. Blend everything except nutmeg with 1 to 1 1/2 cups of crushed ice for 5 seconds. Pour into a chilled metal cup or pilsner glass, adding more crushed ice to fill. Top with a dusting of ground nutmeg and garnish with a cinnamon stick. Served by Tony Ramos at Don the Beachcomber in Hollywood in the 1960s. Matt Pietrek (aka Cocktail Wonk) takes a closer look at the 151 Swizzle on the Distiller Blog. Pulse blend with 1 cup of crushed ice for no more than 5 seconds. Pour into a chilled metal cup or pilsner glass, adding more crushed ice to fill. Garnish with a cinnamon stick. These two versions represent the latest evolution of a seemingly simple cocktail that has been very difficult to nail down. Both are absolutely delicious (the drink continues to earn one of the highest ratings in our cocktail guide), but for some reason it’s not always consistent and you may encounter a sweeter or a stronger version when you come to The Mai-Kai. These two tributes represent these variations. The differences are slight, but the additional Pernod and bitters, plus slightly less grenadine and falernum, does indeed make for a more intense drink (version 5). If you prefer the sweeter Swizzle that has been more common over the past several years, you’ll love version 6. Both contain the same ingredients, so feel free to enjoy both and compare. But beware, this is one of the strongest cocktails on the menu due to the healthy dose of 151 Demerara rum, the signature ingredient in this classic. These latest recipes also account for the current rums used in The Mai-Kai bars (as of June 2017). The new release of Lemon Hart 151 returned in late summer 2016, replacing Hamilton 151. This was the second return for Lemon Hart, which was replaced by Hamilton in 2015 when its previous version (the “red label”) went off the market. Hamilton was a fine replacement, and could even be considered perferable if you’re looking for a more intense, punchy cocktail. But the 151 Swizzle at The Mai-Kai is fine with either rum. Both have the distinctive Demerara flavor that was featured in the original. Use a non-Demerara 151 rum at your own risk. The other rum featured here also dates back to the early recipes of Don the Beachcomber. Though it doesn’t appear in his 151 Swizzle recipe above, Donn Beach was a fan of Dagger dark rum from Jamaica. This classic rum is no longer available, but the hard-to-find Kohala Bay is a very similar “punch brand” Jamaican rum that became the standard in many of The Mai-Kai’s best drinks. Unfortunately, it too went off the market and became unavailable in April 2016. But the replacement, Appleton Estate Reserve Blend, works well as a complimentary rum, adding a lot of flavor and balance to the heat of the 151. These versions are pretty near a perfect 151 Swizzle, showcasing the rums and punch of anise and spices with just the right amount of sweet and sour for balance. * The rich sugar syrup, falernum and grenadine give the drink a great underlying sweet and spicy base that perfectly offsets the high-octane rums. If you’re making syrups at home, use a 2:1 ratio of sugar to water to duplicate the richness of The Mai-Kai’s syrups. * A good falernum, such as the Fee Brothers brand, is crucial. The new Beachbum Berry’s Latitude 29 Formula Falernum from Orgeat Works is also recommended. There are also many resources online on how to make your own. * Use a rich and potent grenadine, such as the Fee Brothers and B.G. Reynolds brands. You want a product that has both bold flavor and color. * You can simulate the Dagger/Kohala Bay flavor by combining equal parts Smith & Cross Navy-strength (104 proof) Jamaican rum and El Dorado 12-year-old Demerara rum. Smith & Cross is also hard to find, but not nearly as rare as Kohala Bay. We recently conducted extensive testing to find more potential replacements for Kohala Bay. See the results here. The frozen metal cup with ice mold is this classic’s coup de grâce. It makes for an incredibly cold cocktail that manages to be both decadently drinkable and highly potent. The new stainless steel Swizzle Cup from Beachbum Berry and Cocktail Kingdom is ideal for this. Before this was available, I would troll eBay for high-quality aluminum cups, seen in the photos below. The Everlast brand is typically the best of these. Keep your cups in the freezer for special occasions that call for the potent but delicious 151 Swizzle. Even if you don’t have the cup, don’t skip the cinnamon stick. 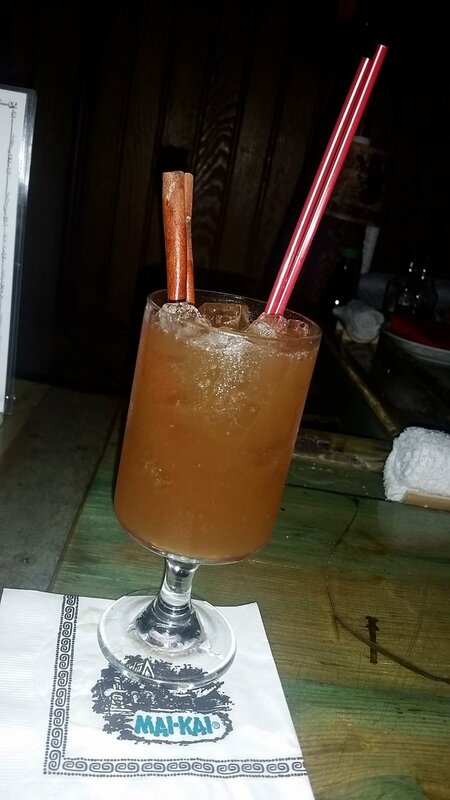 While The Mai-Kai doesn’t always have the authentic metal cup in stock (and foregoes the traditional nutmeg), you’ll almost always get the cinnamon stick. It’s a crucial element that adds to the sensory experience. Due to popular demand (see comments below), and also to document the metamorphosis that the tribute recipe went through, following are the earlier recipes as they appeared here. They may not be as accurate as the latest versions above, but they’re definitely tasty and potent. For many years, I was under the false impression that that the 151 Swizzle (and many other cocktails at The Mai-Kai) contained cinnamon syrup. But this proved to be just an illusion, with other rich spices confusing our senses. The cinnamon stick used for garnish adds to the illusion. As Martin Cate pointed out in our 2013 interview, this drink isn’t always made correctly. It’s also been tweaked somewhat over the years, so I was trying to hit a moving target. Versions 2 and 3 did not include Pernod or cinnamon syrup, while version 4 was the most complex and hit all the right notes that are the hallmark of Mai-Kai cockails. 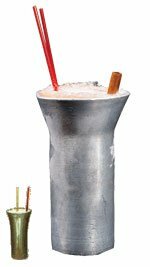 Starting with version 2, I realized (and had it reliably confirmed) that falernum – that mysterious Caribbean syrup with hints of almond, ginger and lime – was also included in Mariano Licudine’s 151 Swizzle. Also, when the Swizzle cups were in short supply, I was able to take photos and examine the color of the drink. I always knew there was a rich sweetness that helped offset the 151 rum, and my first two versions used sugar and/or cinnamon syrup. But the reddish orange hue confirmed that something else was at play here. A rich pomegranate grenadine fit the bill nicely, resulting in version 3. For version 4, I brought everything together in one great, harmonious crescendo. That is, until I later had to remove the cinnamon syrup. So, which recipe is your favorite? The new tribute recipes above or one of these prior versions? Let us know in the comments below. Pulse blend with 1 cup of crushed ice for no more than 5 seconds. Pour into a chilled metal cup or pilsner glass, adding more crushed ice to fill. Top with a dusting of ground nutmeg and garnish with a cinnamon stick. Blend with a half cup (around 4 ounces) of crushed ice for no more than 5 seconds. Pour into a chilled metal cup or pilsner glass, adding more crushed ice to fill. Garnish with a cinnamon stick. This entry was posted in Cocktail reviews, Cocktails, Cocktails, History, Mai-Kai, Recipes, Rum and tagged 151 Swizzle, Appleton, Beachbum Berry, Cinnamon syrup, Cocktail Kingdom, Dagger, Don The Beachcomber, falernum, Hamilton rum, Kohala Bay, Lemon Hart, Mai-Kai, Mariano Licudine, pomegranate grenadine, recipe, rum, The Grogalizer. Bookmark the permalink. Thanks for the work to decipher these recipes. I’ve visited the Mai Kai a couple of times, but being out on the west coast I can’t visit that often. Mixing your interpretations is a lot of fun. Thanks for the kudos, Kevin. We’re only one-fourth of our way through the menu but we’re having a blast. Your old recipe with the cinnamon syrup was very good, even if it wasn’t totally accurate to the Mai Kai.. If you’re willing, you should keep that one on your site as a variation or original recipe. Sometimes the journey can take you to some great places, don’t be afraid of them! Had a 151 swizzle at the Mai Kai yesterday. It was excellent, I never had the Bacardi version, but I really enjoyed the swizzle. You and Quince at Danny’s will be pleased to see both of the earlier versions of the tribute recipe now listed above. Cool, thanks! It’s fun to see the evolution of the recipe. And thank goodness for Smith & Cross, as there’s no Kohala Bay out here in California. Made 2 of these tonight. Tasted just like the Mai Kai, or as I remembered it. I used El Dorado 15/Smith & Cross as I haven’t picked up an Kohala Bay yet. Thanks for the recipe! Just had a 151 swizzle last night at the wonderful Mai Kai for a late b day celebration. Fantastic drink and a fantastic place. Thanks for posting the history and variations of the recipe. I am lucky enough to have a great local liquor store nearby that carries both lemon hart and kohala bay. Now I just need the cups! I’ve been going to the Mai Kai for years and have been to 7 Hukilau’s. But last year was the first time I had a 151 Swizzle and it immediately became a favorite. I couldn’t believe that I took so long to try it. So right away I bought a big bag of 5″ cinnamon sticks online and found some flared aluminum cups on Etsy. And now with the latest update Its just like having one at the Mai Kai. This is of course without stumbling around the tiki gardens with a huge buzz after looking at sarong clad cocktail wahines. BTW…everyone should ask for the cinnamon stick when they order at the Mai Kai. Hopefully they will bring them back. I arrive at the Hukilau and since I wasn’t going to the party tonight…off to the Mai Kai instead. So in the Molokai my girlfriend and I order a Jet Pilot and a 151 Swizzle. 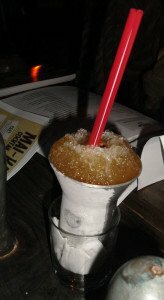 The cinnamon stick was back in, but instead of the ice cone around the top it was filled with ice cubes. Not crushed, but cubes. One step forward.. 2 steps back. The presentation just wasn’t what I enjoyed in the past. 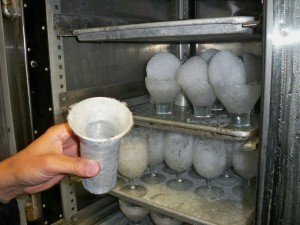 Part of the enjoyment was the frozen aluminum cup w/ice cone so cold it had to be placed in a glass cup. Maybe it was just an off night and they just weren’t prepared. Tonga, if you were there during The Hukilau, it’s possible there was a rush on 151 Swizzles. But as documented above, the presentation has been erratic lately. The glass is not always used, and the ice can vary too. Good to see that the cinnamon stick is back, however. And the drink has been consistently following the latest recipe, which is good to see. I made a return trip on June 30. Both my friend and I ordered a 151 Swizzle. It had the cinnamon stick and was in the metal cup, but still had the ice cubes not the frozen snow. We arrived just as they opened and only 8 people were in the Molokai. I understand that things change and maybe the frozen metal cup with snow maybe no more. However, the ice cubes just don’t seem right…I suggest they go with crushed ice at least. It still tasted great, but the presentation is lacking for such a popular drink. Yes, that’s how it has been served since The Hukilau, so perhaps they’ve taken a step back from the snow ice. It was actually served for many years this way (see the photo from 2011 above), so it’s not surprising. The cup should still be frozen, with a coating of ice inside, even if they don’t pile the snow on top. It would consider that optional.